LOS ANGELES -- Kevin Hogan passed for 279 yards and two touchdowns, Remound Wright rushed for three more scores and Stanford opened Pac-12 play Saturday with a 41-31 victory over No. 6 Southern California. 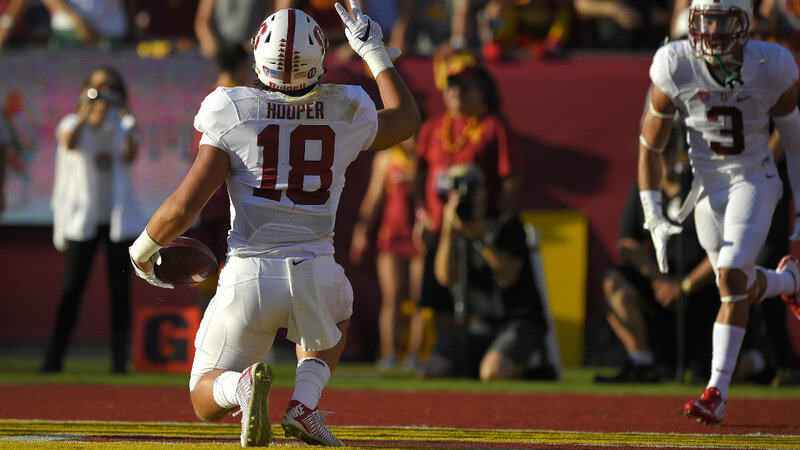 Austin Hooper and Devon Cajuste caught touchdown passes as Hogan finally beat USC for the first time in his career, snapping the Trojans' two-game winning streak in this lively in-state rivalry. Christian McCaffrey rushed for 115 yards for the Cardinal (2-1, 1-0), who scored just six points in their stunning season-opening loss at Northwestern. They looked more like their usual powerhouse selves Saturday during a 474-yard offensive performance at the Coliseum, where they've won four times in their last five trips. Cody Kessler was 25 of 32 for 272 yards and three touchdowns, but USC (2-1, 0-1) couldn't match the steady production of Hogan, who went 18 for 23, and his dominant offensive line. Steven Mitchell Jr. caught two touchdown passes and JuJu Smith-Schuster caught another, but preseason Pac-12 favorite USC failed its first test of the season after beating two Sun Belt opponents by a combined 99 points earlier this month. After USC's impressive start, Stanford took a 24-21 halftime lead with two touchdowns in the final 3:53. Wright's third TD run put the Cardinal up 38-28 with 11:21 to play, and Conrad Ukropina hit a 46-yard field goal with 2:27 left, essentially sealing Stanford's sixth win over USC in their last nine meetings. Stanford and USC began their football meetings in 1905, but the past several years of the rivalry have been particularly memorable. The Cardinal stunned then-No. 2 USC as a 41-point underdog at the Coliseum in 2007, and Andrew Luck's team won a triple-overtime thriller here four years ago. The Trojans won the past two meetings on last-minute field goals by Andre Heidari, including an eventful 13-10 victory at Stanford last season. Hogan didn't excel in either of his first two clashes with Kessler and USC, which largely relied on its defense to beat Stanford twice. Hogan and Kessler both were in elite form for this meeting, but Stanford's offensive line largely made the difference against USC's defense. USC won the opening coin toss and ran the ball right at the Cardinal, going 76 yards on a methodical opening drive capped by Tre Madden's 5-yard TD run. Stanford played without two key contributors on its injury-plagued defensive line, leaving the Cardinal with no tested depth behind its three starters. USC rarely had trouble moving the ball, but hurt itself with eight penalties and didn't get many drives, thanks to Stanford's clock-chewing offense. Hogan and his teammates quickly found the groove they missed in their first two games. The senior quarterback had plenty of time to pick apart USC's secondary for 221 yards passing in the first half, including Hooper's 16-yard TD catch late in the first half. Smith-Schuster put the Trojans up 21-10 with a 54-yard catch-and-run TD in the second quarter, but Stanford scored twice in the final 3:53 of the first half. Cajuste put the Cardinal up 24-21 with 3 seconds left with a 17-yard TD catch when Adoree Jackson fell down. Jackson also had an early 97-yard kickoff return for a touchdown erased by a penalty.